Ash International have come up with an interesting packaging concept for this release, Hazard’s second for the label. It consists of an album and CD, both with their individual sleeves and artwork, that together form a single piece of work. A great idea, but only available as a joint package with the first 1000 copies. The artwork itself shows images of trees and woodland scenery, photographed and designed by Jon Wozencroft. The music takes this theme a stage further, being recorded in the forest of Kungs Norrby in Borensburg, Sweden. Influenced heavily by the international industrial scene, Benny Jonas Nilsen (Hazard) creates emotive ambient soundscapes, reminiscent of Biosphere but with darker overtones. Manipulated sound samples from the surrounding forest are combined with low drones, building the intensity and atmosphere slowly but deliberately. Like Biosphere, Hazard’s music takes the listener to another place, sending images cascading through the mind and captivating in an almost hypnotic way. Each track flows and relates to the next, making track names a formality, the package being an experience more than an album. The beauty of the imagery on the sleeve is in stark contrast to the music contained within, raising the question of whether this is an statement regarding the destruction of forests and woodland world-wide. Combining the initial beauty of these images with dark soundscapes, utilising samples of wood being sawn, chopped, falling and being burnt adds to this theory. Whether this is Hazard’s intention is not clear, but it fits well with the mental images created when listening to this record and CD. An excellent album, intense, darkly atmospheric, emotive and captivating. It certainly warrants looking out for more of Hazard’s work in the future. One thing though, I would advise against taking it for bedtime listening if you plan on going camping overnight in a remote forest, especially if you’ve seen the “Blair Witch Project” movie. The 2nd solo release from Benny Nilsen An LP and CD packaged together in an LP jacket, with typically glorious Wozencroft designed visuals. There’s a twisted sense of complacency in the tracks such that they are almost guaranteed to find favour anyone who has followed the industrial scene from its early days (Hazard’s Benny Nilsen draws on influence’s from ‘old industrial’), but the challenge still remains for an effective fusion of ‘new school industrial’ with techno. Certainly Pan sonic occupy this territory, and further openings have been forced by the few willing to push the electro envelope. Wood is a curious release in that the first 1000 copies come with an LP, the LP containing as much extra music as the CD itself. 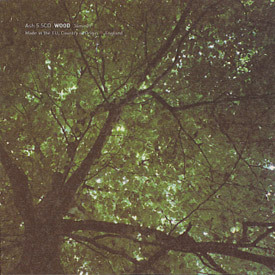 Like most LPs Field/Bridge comes in a card sleeve, within which is a CD-sized card sleeve of a similar design – both decorated with various photos of trees and wood. While this is the second release by Hazard on ASH R.I.P., it is the first I have heard, though I have heard various pieces by Benny Jonas Nilsen’s previous project Morthond. The CD has 6 tracks and starts with Fibre Test, a wavering higher pitched drone. With that there is a light shimmering bell sound and a clicking scratching loop. The chime becomes a pulsing ping layer and bass swells up. Within the risen sounds we can now hear several bells, pealing out like a church calling. A couple of minutes and the clicking increases in agitation, almost suggesting the microscopic growth and the stretching of bark. Cut Out/Replay follow with a sustained chime sound and the swirl of winds through the trees. Which gives a vague sensation of isolation. Warmth creeps in, a bassier edge and rounder feel to the chime and we have a suggestion of day time. There is a sound as of someone climbing out a tent – the strain of fabric and the echoing zip, with footsteps strain through the snow. Thunder rumbles, approaching from Location South, and then there is the start of a light rain. Rain gathering momentum amongst the twigs that cover the forest floor. Branches groan and crack, the wood sounds very much audible. Location South continues with a more invasive wood sound, suggestive of doors creaking and banging while blocks collide. Cords And Branches hums with a little seesaw one-two sound looping intermittently. This provides a minimal minute, though rattling sounds creep in, followed by a sighing “on” sound. A sound triggering a bass humming and a slightly static suggestion. The on-ness sighs in the static and the forest motion rattles once more. All the elements assembled create a central droning sensation with gently bristling detail; leading Cords And Branches to a duration of 11 minutes. The quieter hum of Pylons follows on, an easier sigh, though it gains a droning intensity. A high pitched sound can barely be heard around the edges but the hum is a warm concave signal. A mild lapping is suggested, transforming to a metallic trickle and a light wind. Leaving the conclusion of the Log Fire, a literal title as we hear the crackle of wood transformed to ash and the roar of oxygenation that drives that change. A loop rhythmic bet can be heard, along with a wheezing scrape of air. The beat is like a simple strike one-two but is joined by a high frequency oscillation and a bubbling click rhythm. The roar has died down by now and we’re left wit the motions of more microscopic sounds. Though approaching 5 minutes we strip down to a buzz edged drone layer, the edge developing a higher sound as it progresses to fade. The LP itself contains one track per side these being Field and Bridge. The lengths of these two pieces about 15 minutes each, hence longer than any of the 6 pieces on the CD, even Cords And Branches’ 11 minutes. This gives you a chance to experience a continuation of the ideas of Wood, where all the source material was recorded in the forest of Kungs Norrby in Sweden. With both parts together Wood comes up to over an hour of sound, packaged in the complimentary photography of Jon Wozencroft. Later this summer, former Cabaret Voltaire member Chris Watson will receive an award of distinction in the digital music category at Austria’s Ars Electronica festival. But Watson hasn’t released a shred of digital music since stepping out from Voltaire 17 years ago. Instead, he’s been travelling the world, making field recordings of various natural phenomena. His second solo disc — the work for which he is receiving the award — is called Outside the Circle of Fire, and includes meticulously recorded animal sounds from locations in Zimbabwe, Scotland, Costa Rica, England, and elsewhere. Ars Electronica 2000’s jurors are right on when they argue that the sounds he captures “would be just as well received in a concert of digital music.” Recordings of a male capercallie display or the songs of corncrakes could be outtakes from the latest Autechre album — off-kilter rhythms, foreign timbres. Joe Banks takes a similar approach to pre-existing ambience for his Disinformation project, constructing dense collages of solar radio emissions and VLF broadcast data. He’s capturing sounds that occur naturally, functioning outside of a deliberate compositional framework. These recordings provoke a ton of questions from their listeners: What’s the difference between background “noise” and music? How can we stamp authorship on naturally occurring sounds? It’s hard to get these questions, and the work of Watson and Banks, out of your mind when confronted with recent releases by Mika Vainio (Pan sonic) and Hazard (aka Benny Nilsen). Taking almost the exact opposite approach of Watson and Banks, Vainio and Nilsen construct mostly digital soundscapes that sound environmental. Recorded in the forest of Kungs Norrby in Sweden, the source material for the Hazard release (a nifty package including one record and one CD) is the sound of trees rustling in the wind, sticks and branches crackling and snapping apart. Nilsen took the source material into his studio, adding wavering drones and beds of light static. The finished product is a remarkable simulation of a larger-than-life aural atmosphere. Low-end bass rumbles like thunder as electrified rain slowly crashes to the ground. Distant machinery tears the forest apart. Vainio’s Kajo isn’t as blatantly natural, but it employs similar musique concrète techniques. When the CD starts you can hear Vainio walking into his studio, eventually flicking on the power switch to the machine that will serve as his sound source for Kajo. The music here is extremely minimal and thoughtfully composed; Vainio seems intent on capturing the glitchy nuances of his machine and constructing razor-sharp frequency waves and electronic mist. Pan sonic fans should note that Vainio calls Kajo the first album he’s completely satisfied with. Benny Nilsen’s second record as Hazard comes as a CD and LP set (or at least the first thousand pressed do), with six tracks on the 36-minute digital unit and two more on the 35-minute vinyl. Odd as this might at first seem, the different media suit the resulting pieces quite well; having quiet glitchy runs of excoriated environmental sounds and thin reedy electronics (or are they? Maybe those sounds are made by a glass being run around the rim…? Or the hum of an electricity pylon…?) presented through the crystalline medium of CD certainly works in a different way than if they were back with the pops and clicks of a well-worn groove (though of course there is something to be said for vinyl deterioration in the right context – perhaps the CD tracks of Wood isn’t it though). Likewise, the ambience of Field/Bridge comes partly from its analogue reproduction; though this could be auto-suggestion of course. The two tracks loop accretions of sound debris into slow building near-overloads, a process helped in its effectiveness by that extra vinyl warmth. With interjected squeaks, clattering objects and even what sounds like the microphone being swallowed to spice the rise and fall of humming noise up a little, each piece is allowed to grow naturally to a point where the intervention of Nilsen directs matters to the edges of bearabilty. Sometimes stark, the fragments of real-world sound bring each track around and back from the trap of excess noise for its own sake. Some of Wood is a bit like being shut in a lock-loop dream while someone moves around in the waking world perhaps, where extraneous, identifiable rustles and scrapes intrude but don’t really provide enough escape from the mechanistic nightmare. Benny’s third release departs from his usual wash of droning sound for a found sound type of feel. On the LP and CD, each clocking in at about 35 minutes, he creates the experience of a trip through a forest dreamscape where it is never certain what is real and what is synthetic. The sounds are quite minimal, ranging from the lightest of crackles to the harshest of rumblings, and it’s rather captivating to try and figure out which were site recordings and which he created in the studio. Are those crickets or keyboards? I assume the titles of the three sessions – field, bridge and wood, refer to the sounscape he wants to evoke, and where he got his source material. While this may not be as lush as his two previous outings, it makes for an interesting hike.